Recipe organizer to create, download, rate and share your favorite recipes. Scale recipes for more or fewer servings. Take snapshots then upload to Flickr or Picasa with two clicks. Find what you can make with what's in the fridge by searching by name, ingredients, category, rating and more. Create shopping lists from recipes,then sync with a Windows Mobile phone or print to paper to save writing. Import from RecipeML format and save time typing. 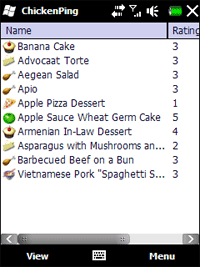 Recipe organizer with shopping lists. Full Windows version also available. Qweas is providing links to ChickenPing Mobile 1.31 as a courtesy, and makes no representations regarding ChickenPing Mobile or any other applications or any information related thereto. Any questions, complaints or claims regarding this application ChickenPing Mobile 1.31 must be directed to the appropriate software vendor. You may click the publisher link of ChickenPing Mobile on the top of this page to get more details about the vendor.